There is and will be some confusion in the nomenclature about this sage. Originally called S. fulgens, it was split off and given the name S. cardinalis, then recently recombined into the species. 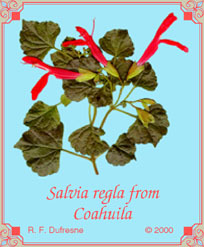 Most lots of S. fulgens being sold now are this plant. However, most herbarium specimens of the species in the wild look a lot more like S. gesneraeflora, a very different species with longer, more slender tubed flowers, much smaller bracts that form an insignificant involucre, and much wider and larger leaves. There are some specimens from Mount Tancitaro in Michoacan with intermediate features. This selection of the species may be a hybrid from Quail Mountain Herbs named in honor of the herb king of Saratoga, California, Louis Saso. It is the most lushly floriferous selection, but is also the most tender. A tall plant, it works best in part shade. Withstanding subtropical humidity pretty well, it is a favorite of Gulf Coast gardeners. 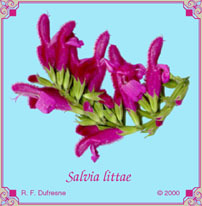 Other selections like the ones from Southwest Native Seeds and the Huntington Botanical Garden may be more valuable for their foliage, which develops fairly strong purple colorations in sun. This feature is present in `Louis Saso', but is not as prominent. A formerly elusive and highly desirable sage from Oaxaca, the herbarium sheets at the Gray Herbarium dated 1888 still show appreciable color. This species looks like a cross between S. elegans and S. buchananii, having the color and hairiness of the latter and the growing habit of the former with dense spikes of flowers. It can handle subtropical weather, and has overwintered for me in Greensboro. Like S. cacaliaefolia, it grows in two forms, depending on conditions. 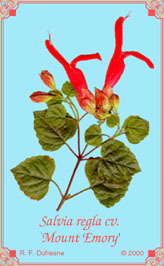 Under stress, it forms a spreading mat; in good growing conditions, it grows into an erect shrub. The flower spike in the illustration came from the spreading phase of the plant. I am interested in getting feedback on how this sage will do as a cut flower. 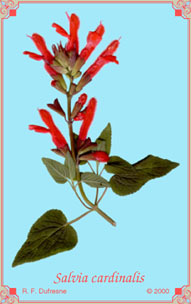 An unusual sage, plants can grow into an arboreal form (to 12 - 15 feet) under ideal conditions. The trunk on one roadside plant near Jame, Coahuila had a caliper and fiber density that made me think of a Louisville Slugger baseball bat. The flowers in the wild were 3 inches long. The foliage is robust and glossy, a lot like birch leaves in size and shape, giving the plant a handsome appearance when not in bloom. At Greensboro, the flowers were smaller, and growth not as large. In order to get it to survive, it will probably have to be grown in a pot until it has a caliper of 1 - 2 centimeters before setting out. It seems to prefer Mediterranean conditions more than the more southern forms. Cuttings need to be done in late summer, and seed set is weak for this plant for some reason. The more southern selections of this species do not have the arboreal habit of its northern relatives. Instead, growth is more like coppice, with many stems coming from the base. Leaves are definitely hairier, and the plant is more xeric than montane in habit. The foliage display is denser, to the point where it weeps from the weight of the flowers. It handles Greensboro summer humidity well. The most hardy form of the species, it is known in Big Bend as Pride of the Mountains for its flower display. It sets seed well, and forms a fairly large, dense trunk like the Coahuila selection. The plants are deciduous and should not be watered heavily in the winter greenhouse. `Warnock’s Choice’ is another selection named in honor of Dr. Barton Warnock of Sul Ross State University in Alpine, Texas. Hummingbirds are much attracted to the blooms of these shrubs.